Amazon Pay Wallet is Offering The Upto Rs.300 Cashback Offer For All The Amazon India Users. This Offer is Valid For All users & Can Get Max Rs.300 Discount in 1 Account. 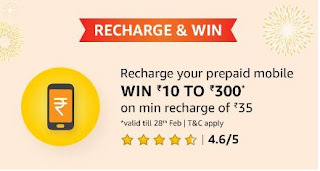 Max Upto Rs.300 Discount You Will Get In 1 Successful Recharge. 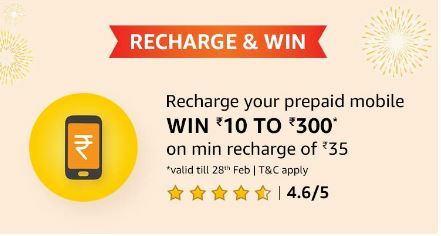 This Offer Is valid from FEB 1, 2019 to FEB 28, 2019 & You Can Do All Your Recharge For Free. Even This Offer is Valid For All Operators Including Airtel. Follow Below Steps To Get The Discounted Recharge. 5. Put Your Mobile Number, Operator, Recharge Amount (Minimum Rs.35 Needed) Etc. This Offer is valid from February 1, 2019 to February 28, 2019 (both days inclusive) (“Offer Period”), unless extended or revoked by APIPL in its sole discretion, without prior notice and without any liability.